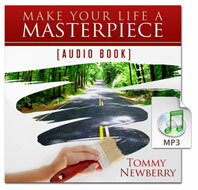 This is the title of an audio presentation by Tommy Newberry that has the power to change your life for ever. Tommy is the best-selling author of, among others, The 4:8 Principle and Success is Not an Accident: Secrets of the Top 1%. He also is the founder of the 1% Club – those he personally coaches to success. You can find many of the resources he uses at www.tommynewberry.com. His audio presentation below is 1 hour 45 minutes long – that’s a lot of time out of your busy schedule but I promise it will be worth every second. I listened once, then a second time taking 8 pages of notes! Tommy charges $350 for a half hour of one-on-one coaching, so this is worth at least $1200, and much more. Please have a pen and plenty of paper handy and be prepared to pause the recording so you get the most out of Tommy’s wisdom. Is your life a masterpiece right now? Do you believe God has great plans for your life? Tommy Newberry and we do! We know that you were created and blessed with great potential… with the ability to make your life a real work of art. In this live presentation, Tommy shows you how to transform life’s seven construction zones into seven acceleration zones. Understanding this hallmark “Results Model” lesson can revolutionize your marriage, your parenting, your business and your entire life. Why wait for change? Create real change, starting today! Think about it… What could your life look like 3 years from now? What should your life look like? How about ten years from now? It’s completely up to you. The future is your canvas and you hold the brush. Start today. Learn how to Make Your Life a Masterpiece! If, after listening to this presentation, you are ready for more specific coaching from Tommy, we suggest investing $99 in his all-digital coaching course.